The deep sea is the largest contiguous habitat on the earth, covering two thirds of the earth’s surface and averaging over 3.5 kilometers deep. Because most deep-ocean waters are connected, many species of deep-sea animals have huge geographic ranges. For example, one deep-sea fish that was previously identified in the Southeastern Pacific has recently been found around the Hawaiian Islands and off the coast of Central California, according to a new paper by MBARI researcher Lonny Lundsten and his colleagues. Scientists call this unusual fish Hydrolagus trolli, but its common name is the pointy-nosed blue chimaera. First named in 2002, it is known to live in deep waters around Australia, New Zealand, and New Caledonia. But until the recent paper, it had not been officially identified anywhere in the Northern Hemisphere. Chimaeras are unusual fishes. Like sharks, their bodies are not stiffened by bones, but by plates and bone-like bits of cartilage. Like the chimaera from Greek mythology, which had a goat’s head, a serpent’s tail, and a lion’s body, chimaeras are pretty weird looking. Even the common names for this group—ghost sharks, rabbitfishes, and ratfishes—sound like creatures one might see at Halloween. However, chimaeras are relatively common and widespread in the deep sea, with 38 known species around the world. In 2009, MBARI researchers worked with scientists at the California Academy of Sciences and Moss Landing Marine Laboratories (MLML) to identify a new species of ghost shark in the Gulf of California. Some of these same researchers had also seen ghost sharks during remotely operated vehicle (ROV) dives off Central California. They weren’t sure about the exact species, but they knew the fish did not look like either of the two species of ghost sharks previously identified from off the California coast. In their paper, researchers refer to the fish as Hydrolagus cf. trolli. The letters cf. indicate that the researchers believe the physical characteristics of the fish they saw closely match the official species description for Hydrolagus trolli. Their alternative hypothesis is that the fish in MBARI’s videos are an entirely new species of ghost shark. The researchers note that they can’t positively identify the ghost sharks in the ROV video without actually collecting one of them and bringing it back to the surface. This is much easier said than done, because these fish are generally too large, fast, and agile to be caught by MBARI’s ROVs. If and when the researchers can get their hands on one of these fish, they will be able to make detailed measurements of its fins and other body parts and perform DNA analysis on its tissue. This would allow them to either remove the cf. from their species description, or assign the fish to a new species altogether. 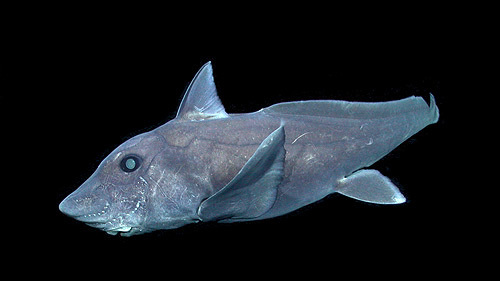 Similar looking, but as yet unidentified, ghost sharks have also been seen off the coasts of South America and Southern Africa, as well as in the Indian Ocean. 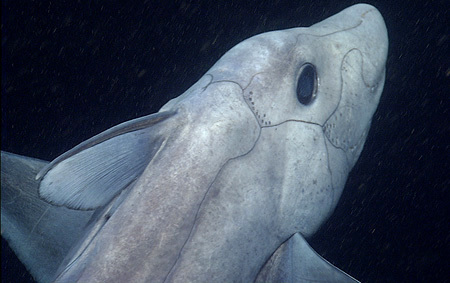 If these animals turn out to be the same species as the ghost sharks recently identified off California, it will be further evidence that, like many deep-sea animals, the pointy-nosed blue chimaera can really get around.